This weekend the 405 Freeway was shut down for hours after one of the largest accidents in recent memory in California. A bus plowed through the center divide and injured approximately 40 people on Sunday afternoon, sending many to the hospital. Read on for more about the accident, and contact a skilled California auto accident attorney with any questions about possible personal injury claims. Around 1 p.m. on Sunday afternoon, a private charter bus was carrying 37 passengers back from a church event in Inglewood. The bus was heading north on the 405 Freeway when it hit several cars on the northbound side, then crashed through the center divider and collided with other vehicles heading southbound. The bus reportedly caused additional collisions on both sides of the freeway. The accident occurred on the 405 in North Hills near the Nordhoff Street exit. Both lanes of the freeway were closed after the accident. Northbound lanes were reopened around 5 p.m., but southbound lanes remained closed until after 11 p.m. Sunday night. Responders evaluated 44 patients and estimated 40 were injured in the accident. At least 25 of those injured were transported by ambulance to a local hospital to be treated for their injuries. Five people were listed as being in critical condition after the accident, including the bus driver who suffered at least several broken bones. The driver was a woman in her forties. The cause of the crash has yet to be determined and remains under investigation. Both the driver and her employer could face significant liability, particularly if either she or the vehicle were unfit for transport for some reason. 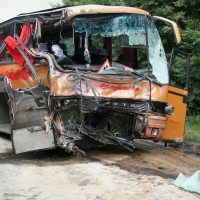 Federal statistics show that bus and large truck accidents have been on the rise in the last few years, with fatal accidents having increased by an astounding 29 percent between 2009 and 2016 from 3,432 to 4,440. The reports show, however, that the numbers were even higher in 2005, with 5,231 fatal bus and large truck crashes reported that year. The total number of injury crashes increased by 60,000 in 2009 to a staggering 119,000 in 2016, double the 2009 numbers. Transit buses account for 34 percent of those accidents. If you have been hurt in an Antelope Valley bus or auto accident, talk to a seasoned and dedicated personal injury attorney about pursuing a claim for damages by calling the Kistler Law Firm in Palmdale at 661-206-6990.